In this post we're going to have a look at localizing DataAnnotations. Observe the following data annotated snippet. On the frontend (assuming you're using Razor), you will generally do something like this. In a nutshell, the LabelFor helper will output the display value associated with the property while the DisplayFor helper will output the most appropriate editor template it can find, e.g. date picker for a DateTime, checkbox for a bool etc. The nice thing with this approach is that we've got a central point governing the output (and thereby input - validation) of our properties (perhaps too tightly coupled for MVC?). Now in order to localize these properties, we need to add resx files to our solution, in the sample git repository linked with this post, I added resx files for Afrikaans and English, seen over here. Note the use of Access Modifier: Public - this is required in order to make the resources visible to our models, quite strange that this isn't the default modifier, don't you think? The amended snippet (using the resource files) will look something like this. Hmm, not all that pretty though (starting to resemble something out of Frankenstein's monster), seeing that you will need to assign a ResourceType / ErrorMessageResourceType to every decorated property. Some alternatives I've seen on the web involves inheriting from the DisplayAttribute and encapsulating the ResourceType property inside the inherited class - crappy thing is that you will need to do this for each and every DataAnnotation type that you're planning to use. Another alternative is to write a custom DataAnnotationsModelMetadataProvider (included in Sample2 of the git repository) - along with a very simple attribute. The amended snippet (using the custom ResourceTypeAttribute along with the custom meta provider) looks something like this. Instead of assigning a resourcetype to every property, we simply decorate the parent class. You will notice that the DisplayAttribute is present in all of our snippets - its use is fairly repetitive, what if we could automate its inclusion into our code? Enter PostSharp, instead of manually adding meta data, e.g. the display data annotation (among other things) to our code, its possible to bake these attributes into our classes compile time using the TypeLevelAspect - have a look at the ResourceTypeAttribute over here in Sample 3. The amended snippet looks something like this. 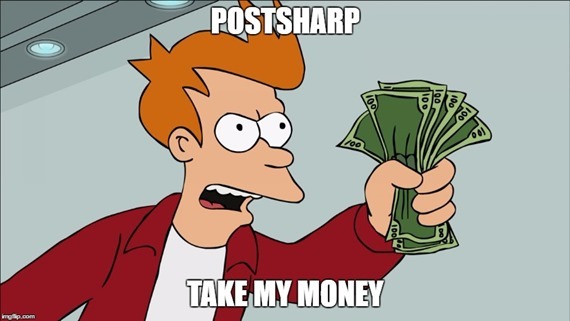 Note that these features are only included in the postsharp pay-for versions.